A Public Space Protection Order is coming to a large part of the area around Lavender Hill. The order is aimed at dealing with street drinking in the area by the cut-through from Queenstown Road to Ashley Crescent covers all the Shaftesbury Park Estate, many of the roads to the south of Lavender Hill and to the north on both sides of Queenstown Road. I did a lot of work representing local residents in getting this even though, I have to confess, I am not a supporter of such moves. It is one of those peculiarities of representative democracy that occasionally you have to represent views you don’t share. However, having implemented several council policies with which I disagreed (although several of which have subsequently been reversed—one of the reasons I rate Ravi Govindia as a leader is his willingness to reconsider policy when he gets things wrong) I really can’t complain about this. I do have several issues with such zones. One is that I do find it rather hard to believe that extra powers are needed, is there really a need to regulate defecation in public? Another is that if the resources aren’t there to deal with it at present, from where will they come now? My biggest issue is the concern that it doesn’t really solve problems, it changes them or shifts them. A zone doesn’t cure alcoholism so the drinkers go elsewhere. When a similar zone was implemented in Roehampton one of my former colleagues commented that they didn’t care if the drinkers “went off and drank themselves to death, as long as they did it in their own home.” Perhaps I’m too much of a bleeding heart. However, my views are academic and I have the luxury of not living near the affected area (although I do live in the zone). While I think there were faults with the consultation (I know very few people who received it, including the people most affected, I certainly did not get one) it seems to have resulted in a positive response: I was told that there had been about 30 responses in favour with only one objection which officers believed had misunderstood the question. 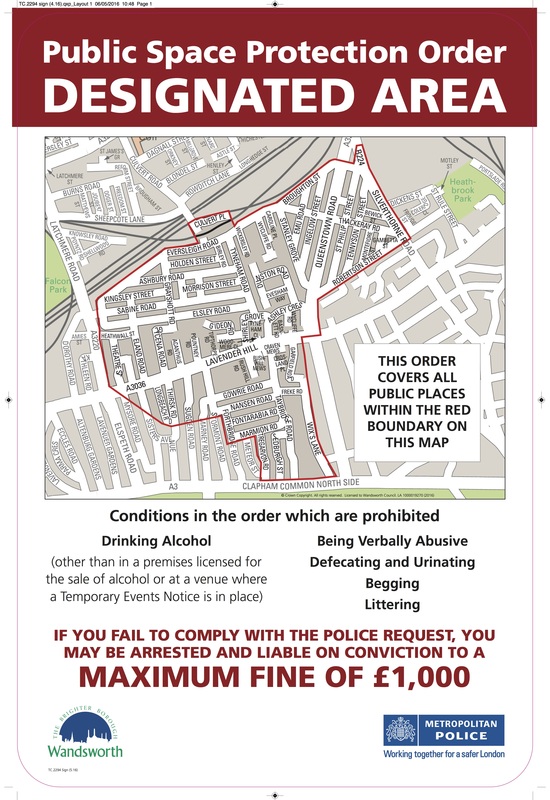 The street drinkers are being given leaflets to make them aware of the zone and signs are being erected to highlight the behaviours prohibited by the order. Once finally in place it will hopefully improve things for the local residents.